Well this was to be a very different day! I woke at 6.00am to the sound of rain on the tent and had to pack my rucksack inside the tent to prevent everything getting wet. 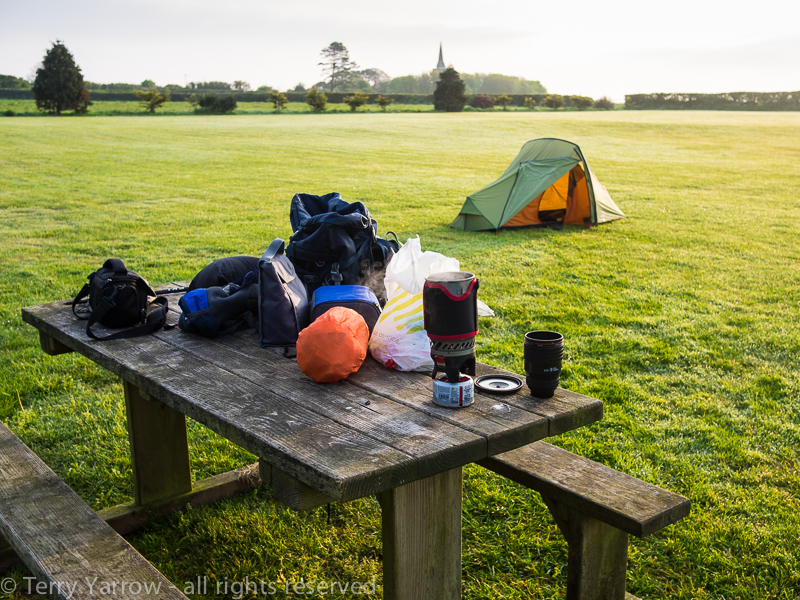 This was no easy task in such a small space – in fact, nothing is easy inside a small one man tent but you learn to adapt to the available space very quickly. 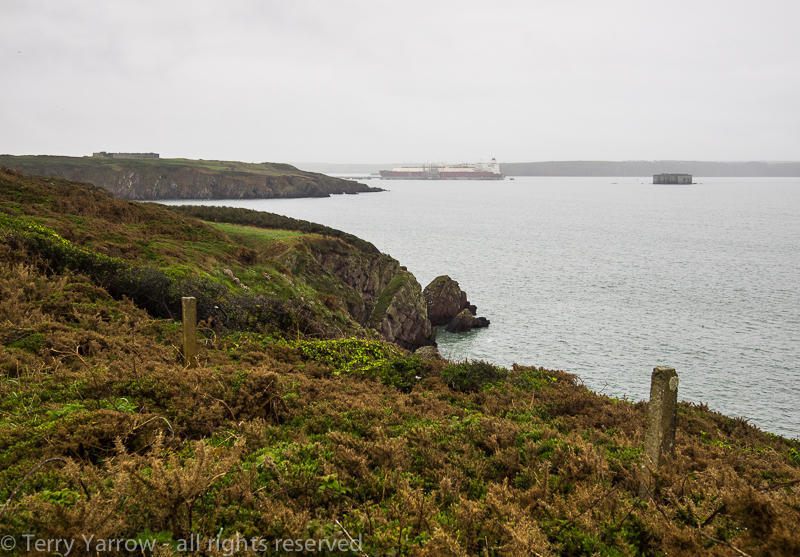 At 7.15am I set out, following a somewhat rough coast path round the headland and very soon the Milford Haven tankers came into view alongside the distant jetties. 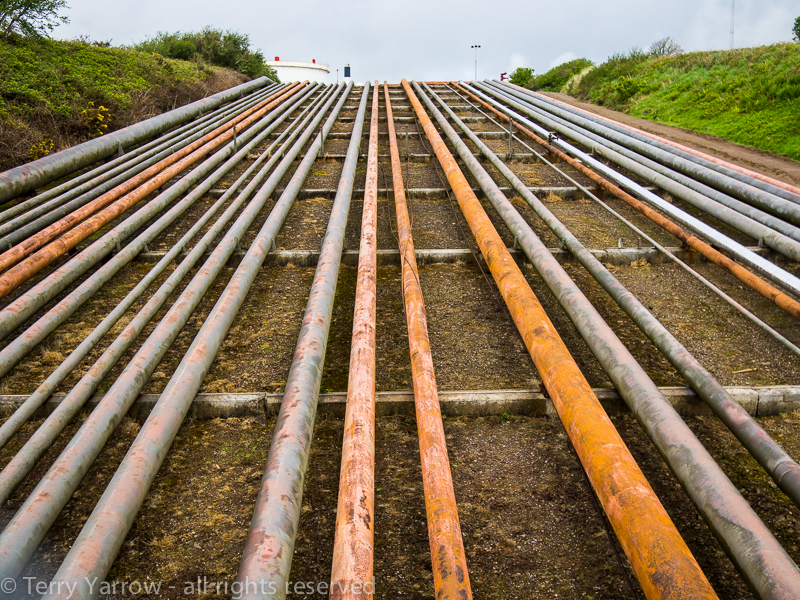 These were once oil jetties but now the tankers carry liquified gas. Out at sea stood the seemingly diminutive Stack Rock Fort, built in the 1850’s to protect the Milford Haven harbour entrance. Passing various war time relics, it didn’t take long to reach and pass under the first of numerous pipelines running out along jetties to the berthing places of the tankers. By now my feet were soaked again from the steady rain and wet grass. The change in scenery was dramatic, from beautiful rugged and wild coast to industrial hinterland, and that industrial hinterland was to stay with me for the next two days. 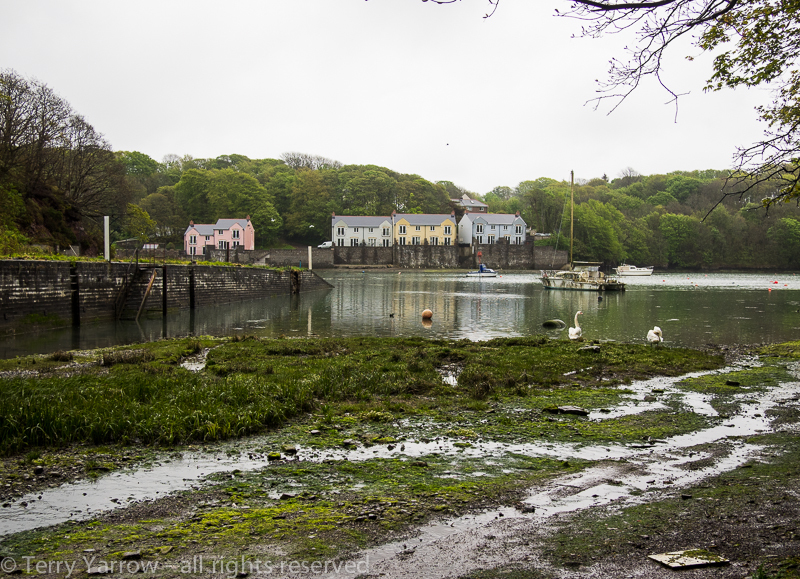 For a time, the industrial gave way to the residential as I passed through the town of Milford Haven, trudging the streets in the pouring rain. A local resident walking his dog passed me and called out cheerfully, ‘Hello, the weather’s going to improve later!’ It did, but not for some while! Route finding through the town was not straight forward and I had to resort to the guidebook and map to avoid going wrong since the way-marking is less clear than it is on the cliff-tops. 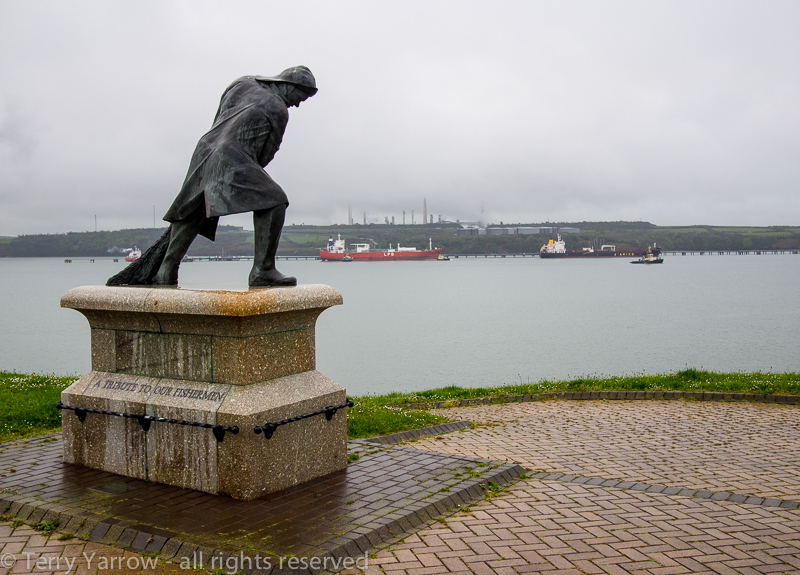 I passed a statue marked as, ‘A Tribute to Our Fishermen’, standing fittingly beside the harbour with oil tankers in the background. The juxtaposition between fishermen and the modern tankers that frequent this harbour now seemed poignant. 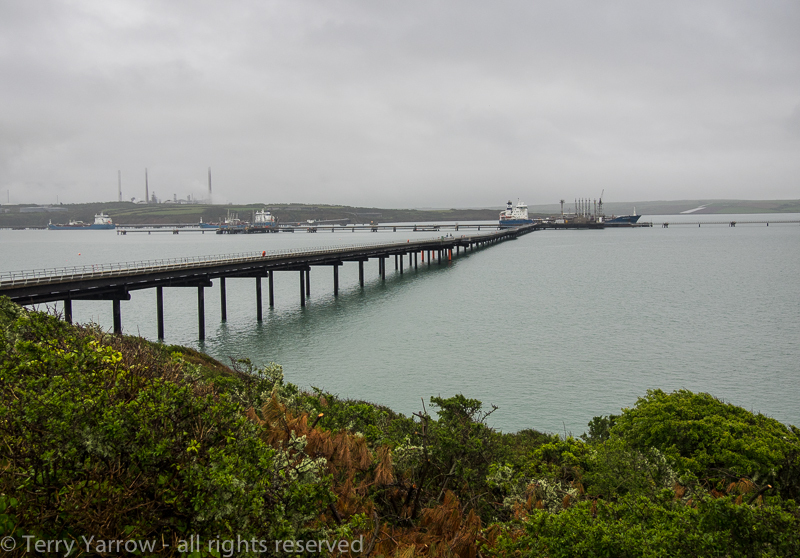 Leaving the town, I rejoined the coast path, but still with a high industrial presence with more pipelines, tankers and refineries, both on this side of the inlet and on the other side that would be my route tomorrow. Even amidst the industrial there were little pockets of wildness such as the lovely inlet of Castle Pill. Standing looking across the water, you could almost forget that this was part of an industrial town. For a short time, my route took me along the road to cross this river and a passing lady motorist, taking pity on me walking in the rain, offered me a lift. As tempting as it was, I politely declined! A little further on, it was impossible to forget that this was refinery country as the path crossed under or over a number of pipelines. 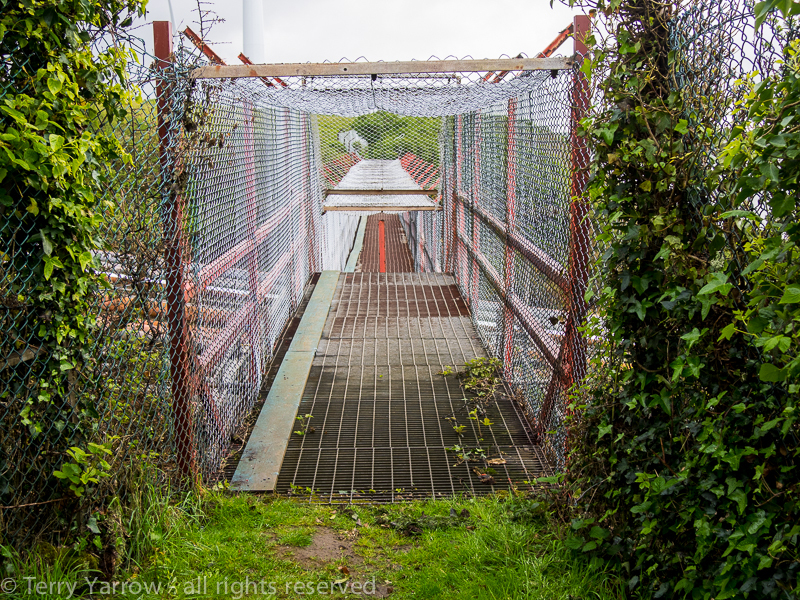 Various bridges and cages had been constructed to allow the coast path to cross the numerous ‘obstacles’ as in the picture below. It certainly made for different and interesting walking! After some time, the industrial gave way again to the urban as I walked into Neyland, a spreading town with a large marina. 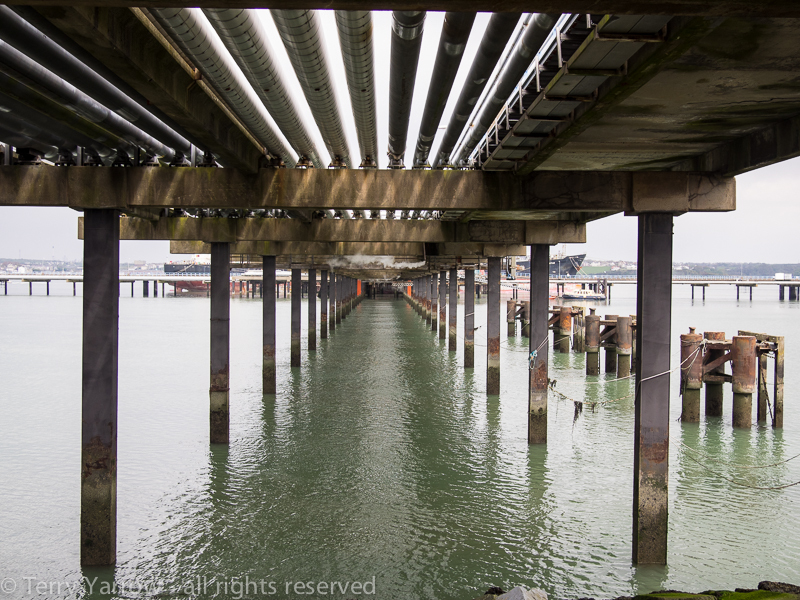 My mind turned to thoughts of tea and bacon sandwiches – well there had to be a cafe at the marina………and there was :)! I dried off, recharged my phone battery, and recharged my battery too – and a very kind lady behind the counter even offered to put some of my clothes through the dryer for me. People are so kind – but I figured I shouldn’t inflict my socks on anyone :)! Whilst I was in the cafe, the rain that had lingered seemingly not wanting to leave me, finally stopped and the sun made an appearance. The food, a change of socks, and a bit of sunshine made a world of difference as I set out once again along the river bank. 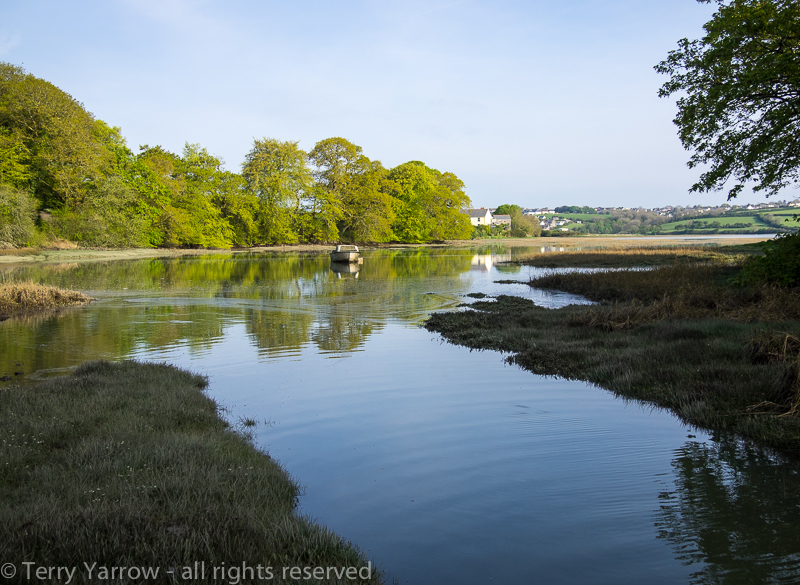 I could see my route out of the town – it was along the Cledau Bridge high above me! 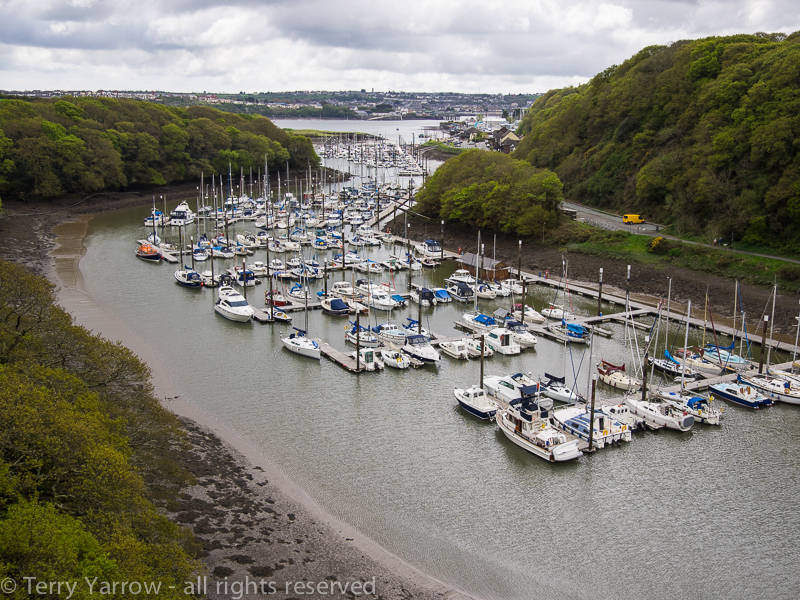 I climbed up the steep bank and crossed the river into Pembroke Docks, taking a last look back across the marina below me. Pembroke Docks was originally a small fishing village known as Paterchurch but it expanded rapidly in the early 19th century following the building of the Royal Naval Dockyard. Its position was ideal, being very sheltered and having deep water and over a period of around 100 years, hundreds of naval vessels were constructed at the yard as well as five royal yachts. 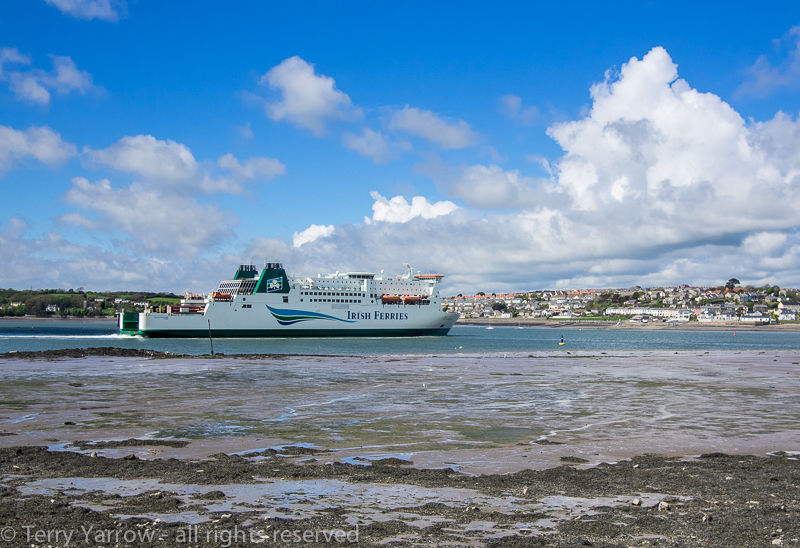 Eventually the dockyard was declared redundant and these days, the only large vessels using the docks are the Irish Ferries. There was one about to leave so I sat on a seat in the warming sun and watched it go on its way. The name Pembroke Dock seems wrong somehow because it is much more than a dock, it is a town, in fact the third largest in Pembrokeshire. It took me some time to regain the coast path proper again as I walked through yet more urban sprawl but ultimately I reached more rural surroundings again. Leaving the town, I followed a somewhat muddy path along the upper reaches of the River Cledau estuary. 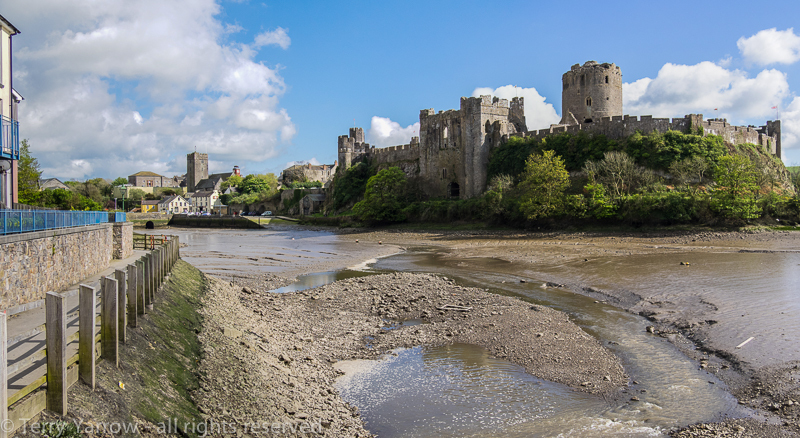 The tide was out leaving acres of mud and I wound my way carefully along the river bank until Pembroke came into view with its castle standing proud above the town. The castle dating from Norman times was, amongst other things, the birth place of King Henry VII. My stopping point for the night was a mile or so outside the town so I stopped off at a cafe for some food en route. Having eaten, I made my way along the road to the campsite and put up my still soaking wet tent so that it would have a chance to dry out before nightfall. It was a beautiful evening and I had the campsite to myself again…..and the luxury of a picnic table too! Not only that but the site had laundry facilities so I was able to dry my things ready for the next day. I lay in my sleeping bag that night thinking back over the day, and what a day it had been! From pouring rain to bright sunshine, an industrial and urban landscape in stark contrast to the rugged wild of the previous eight days, and some lovely people along the way. After nearly 17 miles of walking, I went off to sleep contented. The day began as yesterday ended, with beautiful sunshine. I breakfasted, packed and was out on the trail again by 7.15am. I wasn’t sure what to expect from today but I knew there would be more industrial parts to navigate through – I had hoped there would be more wildness than yesterday though. 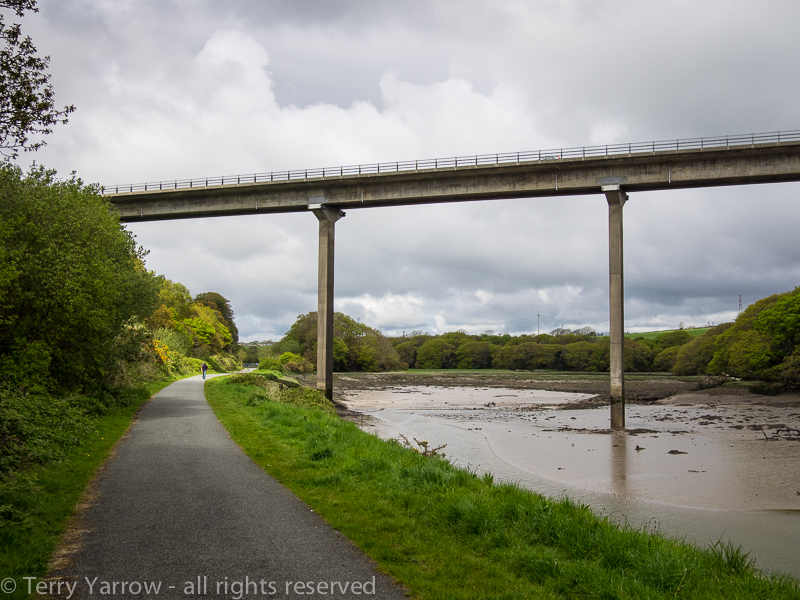 I retraced my steps back into Pembroke where I stocked up on food and then picked up the coast path which followed a B road initially and then an unclassified road, passing Quoits Water Pill. The route was somewhat convoluted, crossing farm land and skirting round refineries etc and the walking wasn’t easy. The grass was long and wet, and the path lumpy underfoot from cattle that had trod there during the wet winter months. I wondered why this was when the rest of the coast path was so well defined and well trodden, and I decided that it was probably because day walkers perhaps do not walk this section so much, preferring the more picturesque parts. 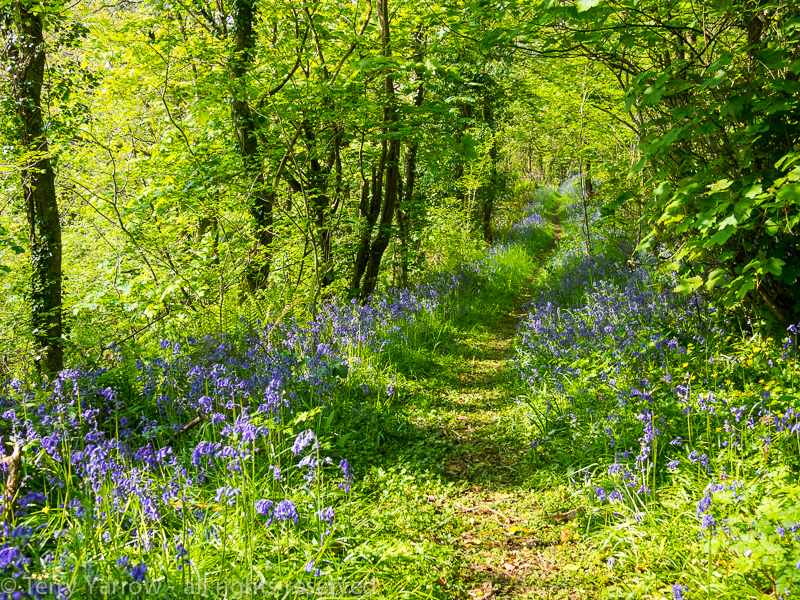 Nevertheless, there were some beautiful parts such as the lovely bluebell strewn pathway below, lit by the dappled sunlight. 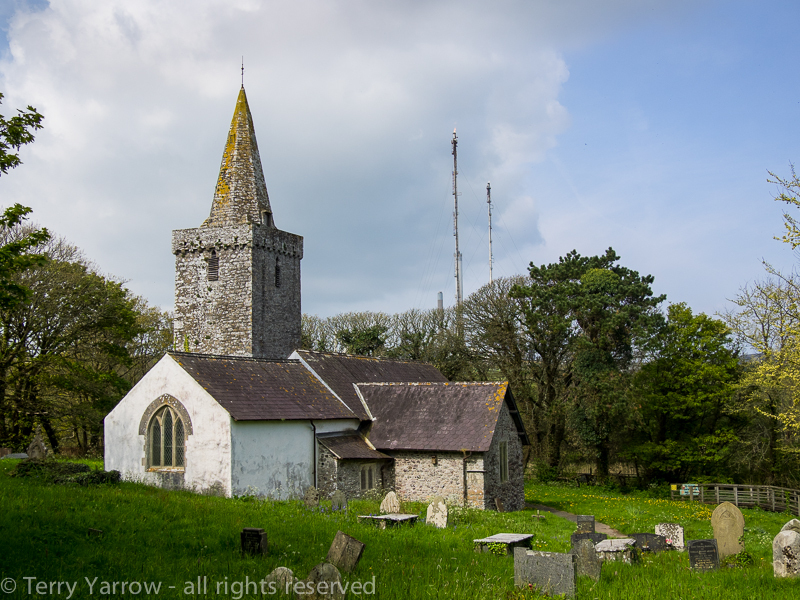 After some miles – I came across the delightful church at Pwllcrochan with a backdrop of flare stacks from the nearby refinery. It may not be obvious from the photograph below but there are flames coming from the top of the stacks, burning off the excess gas from the refining process. 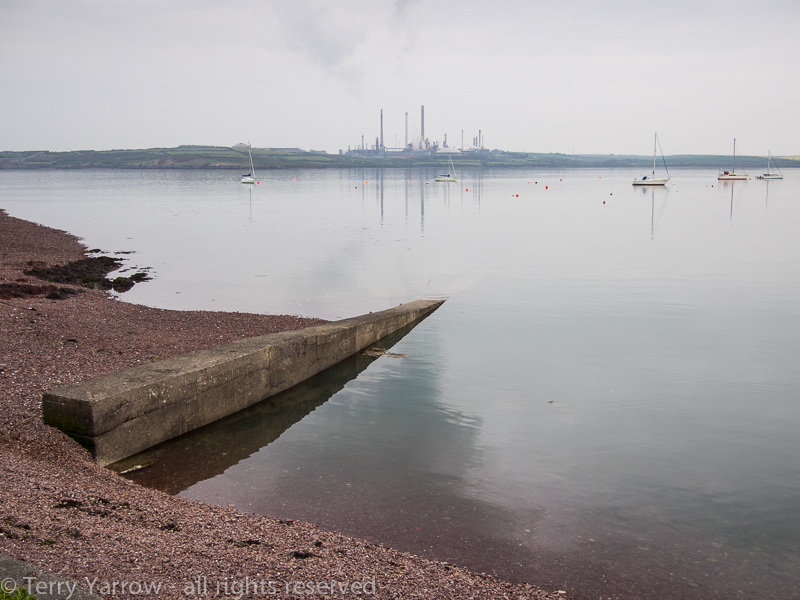 There was a strange sense of isolation, perhaps because the church seems to stand in the middle of nowhere, or perhaps because of the nearness of the refinery, the largest on the Milford Haven complex. That refinery would stay in view for the rest of the day as my route took me around the coast below it. 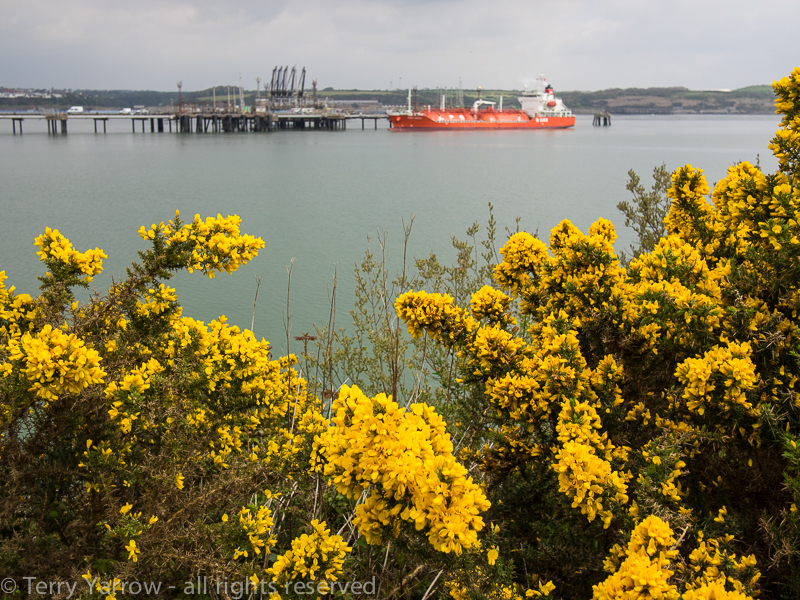 The gorse was vibrant even though the sun had now disappeared again and it really brightened up the walk which once again took me past pipelines and under jetties this time serving the large Pembroke Refinery above me on the headland. Having spent two days walking through a mainly industrial landscape, I longed to get back out onto the coast path proper. 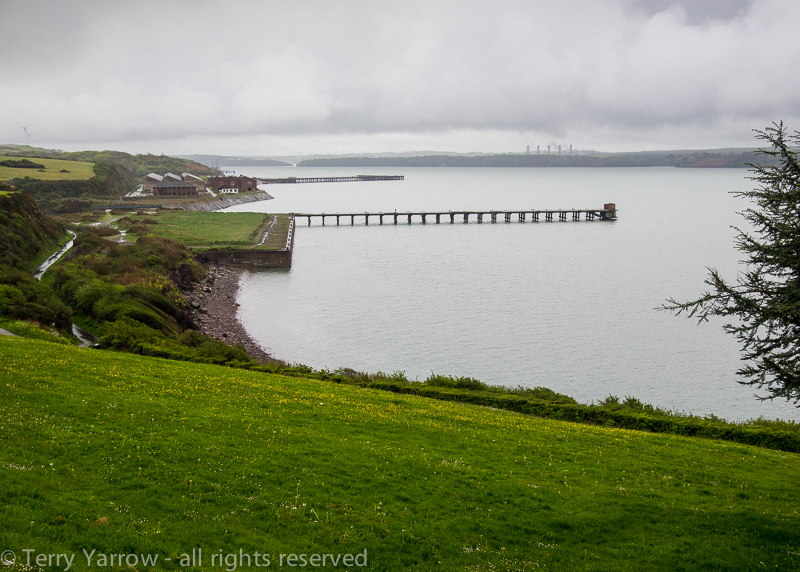 I finally rounded the headland and the refinery and reached Fort Popton, another of the defensive forts guarding the Milford Haven harbour entrance. It was at this point that my route turned south and with the last refinery at my back, I started to circle Angle Bay. The refinery stayed in view but it was getting smaller with each step! Angle Bay was desolate, especially on this now very overcast day, but it was a beautiful desolation. With the tide out, there are extensive mud flats that provide important winter feeding grounds for many waders. 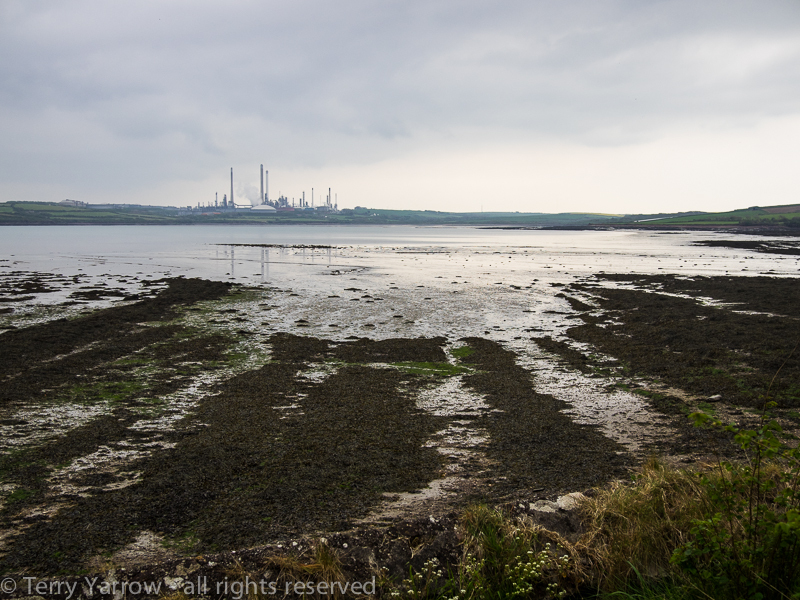 My route round the bay was initially on the refinery road and then on farm land once again turned lumpy by many hooves. My feet were wet and sore when I finally walked into the village of Angle. Although there was a campsite in the village itself, I decided to continue to Angle Point where I came across a rather lovely and quirky pub known as The Old Point House. I called in to ask if there was anywhere I could pitch my tent and was offered the use of a patch of grass at the rear, which I gratefully accepted. The Old Point House dates from 1500 and was originally a single bar local serving fishermen and farm hands. 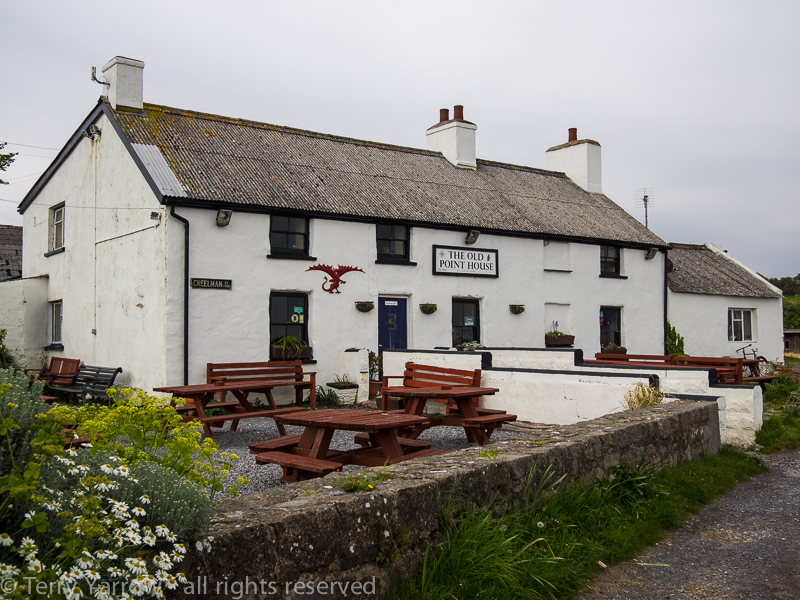 Known as ‘The Lifeboatmen’s Local’ because of the proximity of the lifeboat station, it is one of the top ten pubs in Pembrokeshire according to a review by The Guardian. 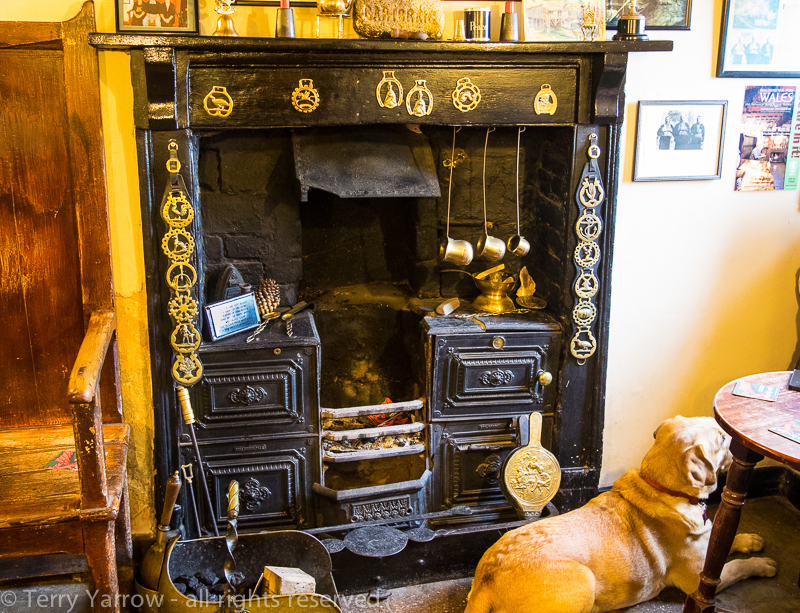 The smallest bar contains a very old fireplace where it is claimed a fire burned continuously for 300 years! I could see that that would be a popular bar on cold winter nights! 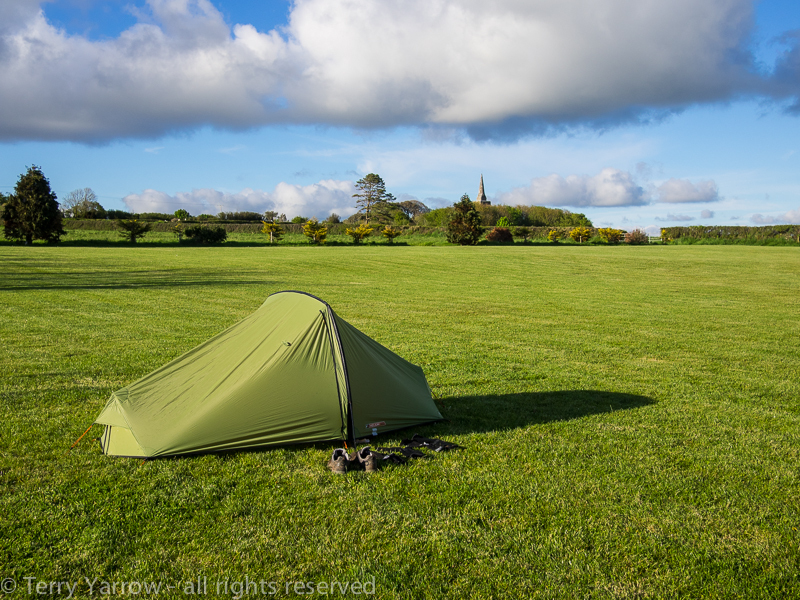 Having put up my tent, I took the very short walk to the pub for a meal and well earned drink……..and of course to write my blog! Before making my way back to my tent for the night, I took a last look from the beer garden across Angle Bay with the refinery fading into the gathering gloom. My route out tomorrow would take me round Angle Point and back to the wild coast again. I was looking forward to it!